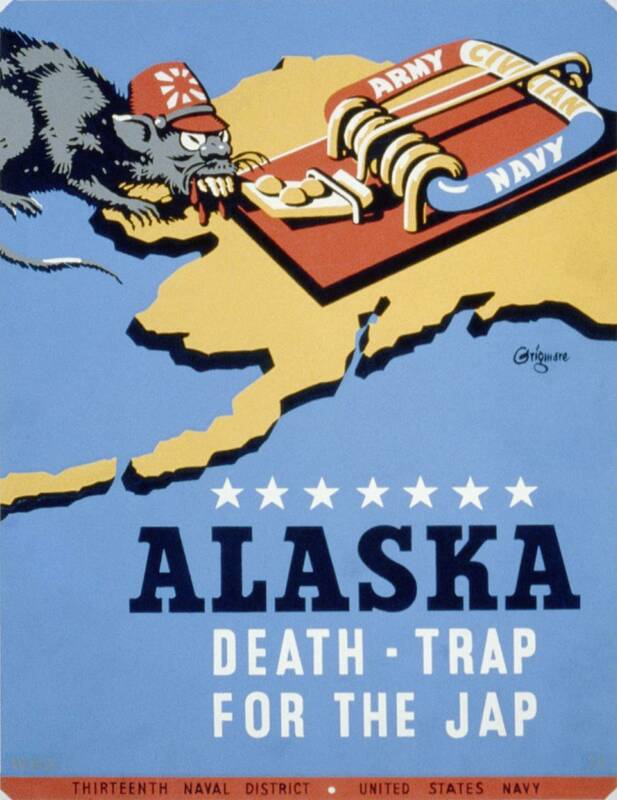 The Japanese Invasion of Alaska ! 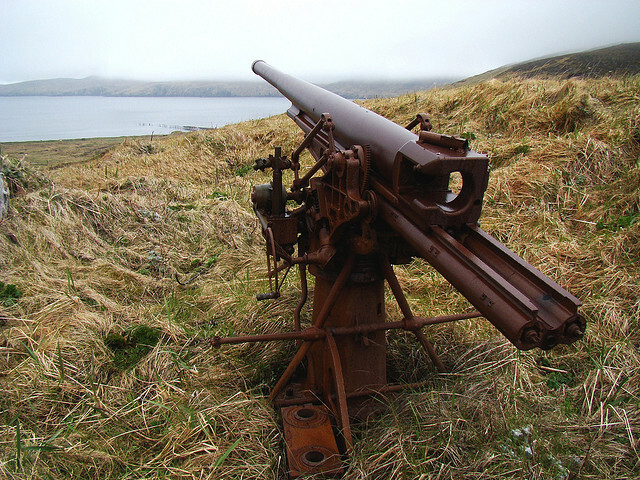 In the 6th of June 1942 early morning, 500 Japanese soldiers landed on one of the Aleutian Islands of Alaska, Kiska. The island was inhabited with only ten men and six dogs whom were taken by the Japanese. By complete surprise the soldiers quickly took control of American soil. 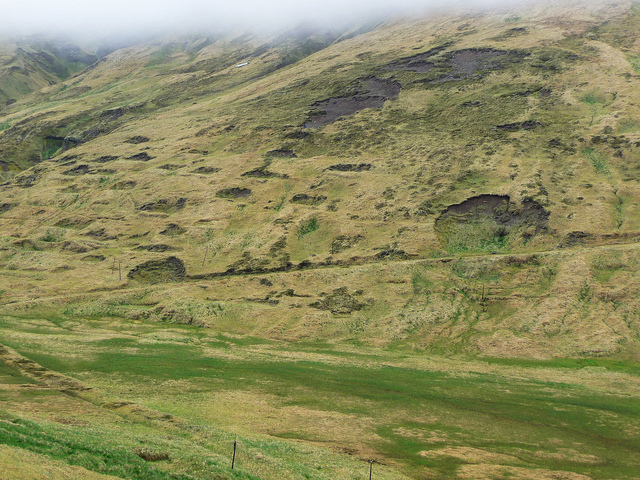 The island now is one of the USA’s National Historic Landmarks, the aftermath of the Japanese invasion can still be seen on the rolling hillsides of Kiska. It is now known as The Forgotten Battle but the invasion caused widespread outrage in 1942. Pearl Harbor was still a fresh memory, having been attacked on December 7 of the previous year. Now, a Japanese military force had stepped foot on American soil – and the 500 had grown to over 5,000 men. 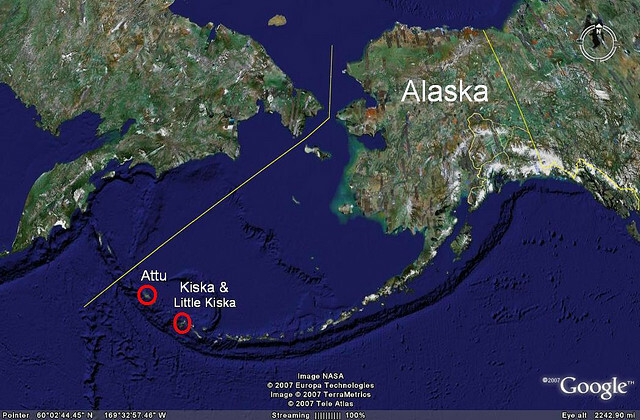 Although Kiska and neighboring Attu (which had been overrun two days previously) were part of the distant Aleutian Islands they were, nevertheless, American. 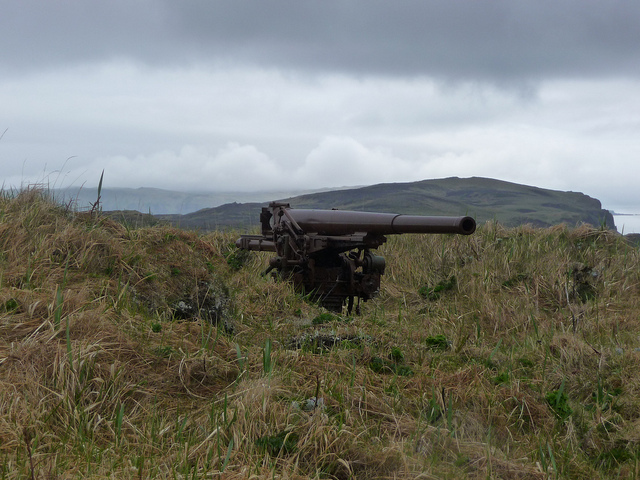 Plans were immediately drawn up to retake the island, known as the Aleutian Campaign. The campaign would not succeed for over a year and would claim many American lives. Although the Japanese had taken the island with little opposition, one man managed to evade capture. 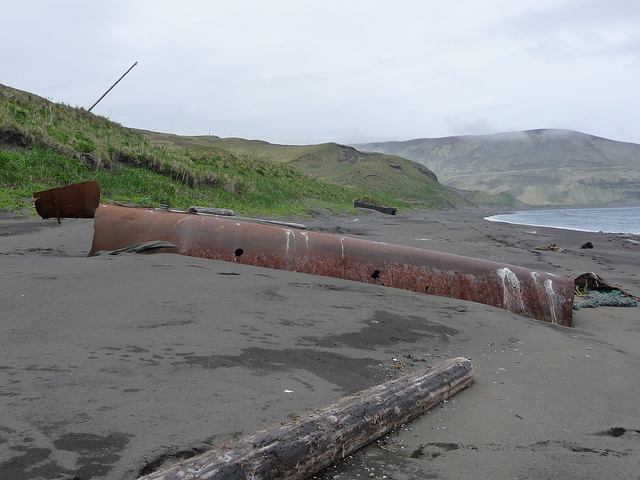 Senior Petty Officer William C House, part of the Kiska detachment, managed to get away from the base. Incredibly, he managed to survive against the odds for 50 days. It was only then, after subsisting on a diet of earthworms and the island’s meagre vegetation that he surrendered to the Japanese. His weight had plummeted to only 80 pounds. 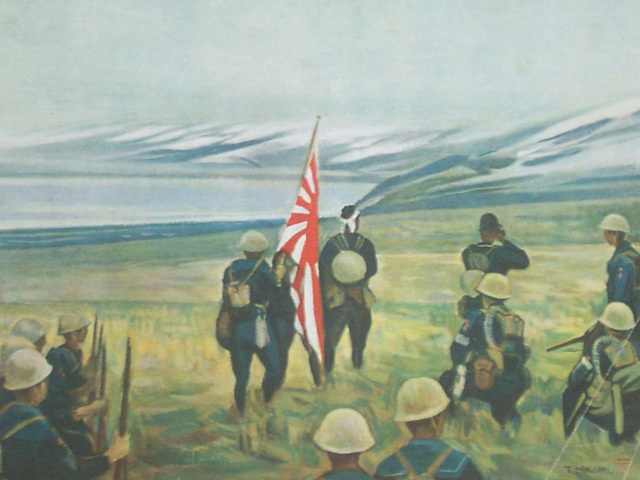 Although artist Tomoharu Mikami was commissioned to paint the above as a celebration of the Japanese conquest of Kiska, it is also easy to imagine them searching in vain for a single missing Chief Petty Officer. 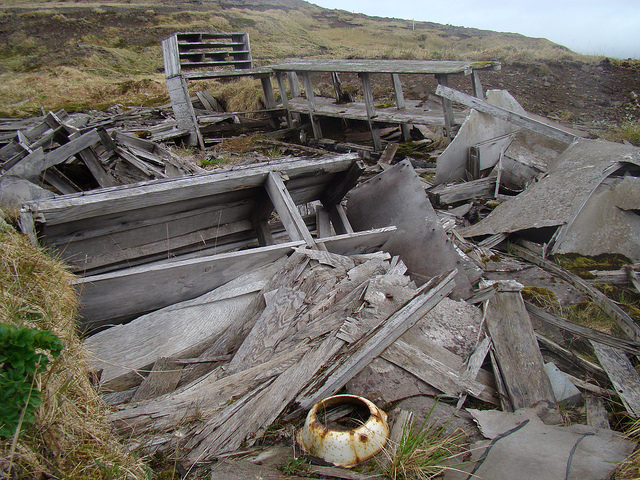 Looking at the desolate landscape today, still marked by craters caused by shell bombardment, one can only marvel at how Senior Petty Officer House managed to survive for so long. His surrender did not guarantee his safety, however. He and the others were sent to Japan for the duration of the war. In retaliation to the invasion, the Army Air Force and Navy Patrol Wing dropped seven million pounds of bombs on the island. 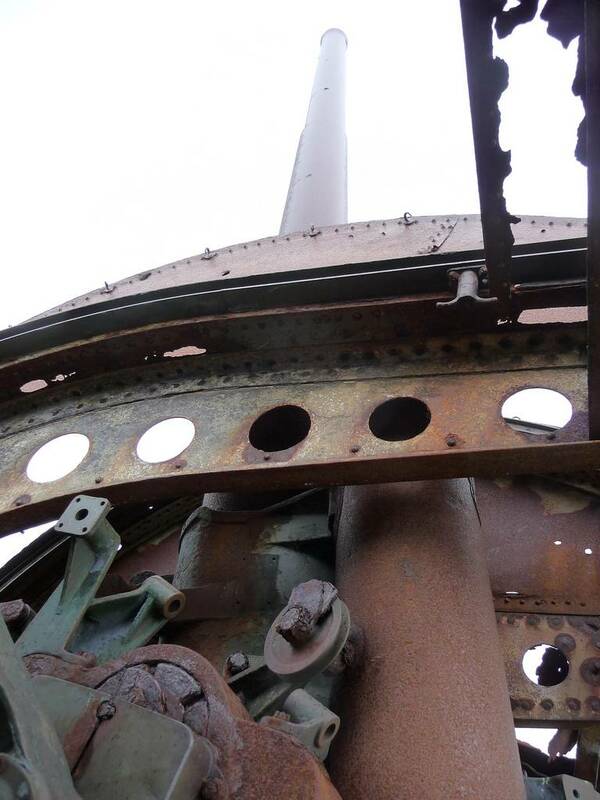 The anti-aircraft response from the Japanese was formidable. 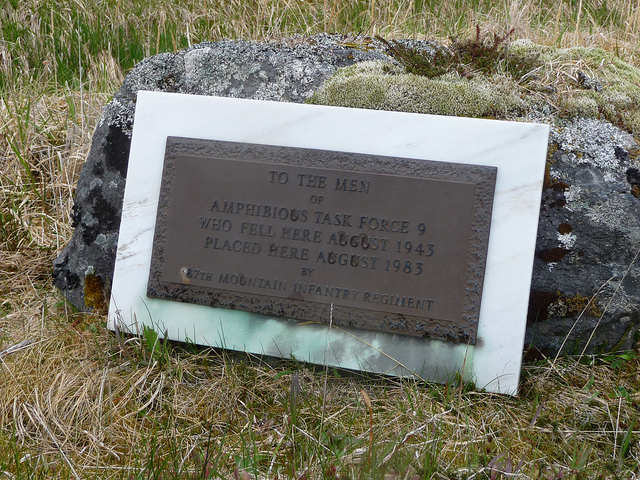 This and the capricious Aleutian climate, where fog and hurricane force winds could rise in moments, led to the deaths of scores of American airmen. 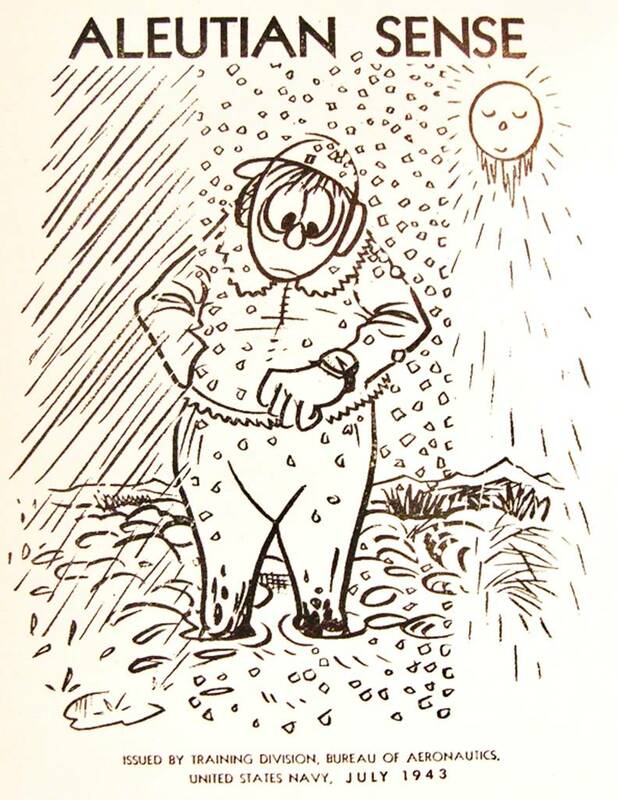 The unpredictable and changeable weather of the Aleutian Islands was neatly summed up in this poster issued by the training division of the United States Navy Bureau of Aeronautics. The humor here cleverly underpins the immense danger each mission posed to the fliers, just in terms of the weather. 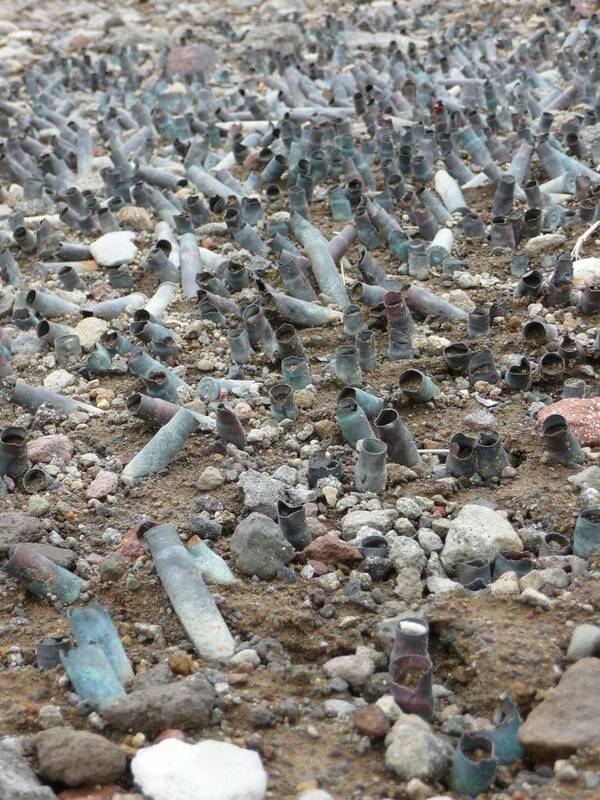 Yet bombs were not the only thing they dropped on the islands. Propaganda leaflets were also released from passing planes. 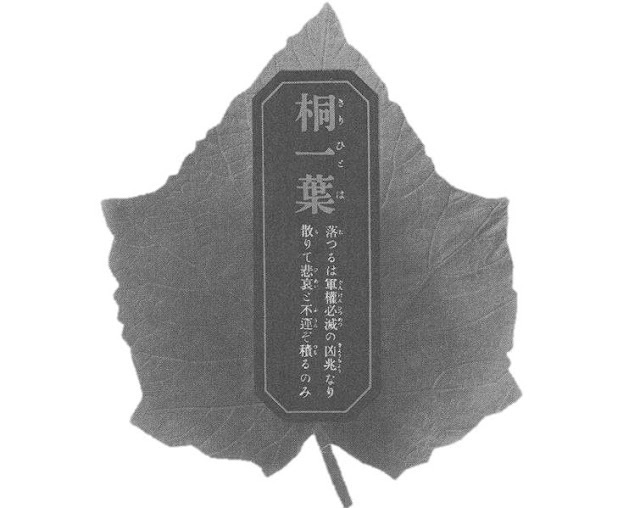 The translation of the leaflet reads: Before spring comes a second time, American bombs, like kiri leaves falling far away, will bring sadness and misfortune. Propaganda was not reserved for the Japanese occupiers, either. 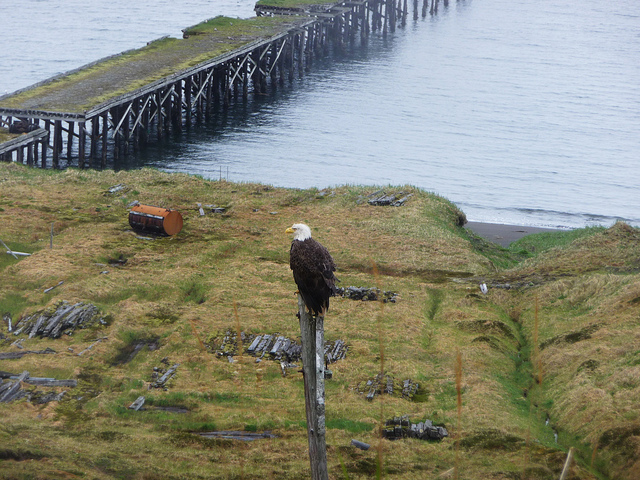 The Alaskan people were consistently reassured that their state was important and would not be forgotten – as well as emphasizing the part they had to play in victory over the Japanese. Although the poster above does to our eyes seem somewhat xenophobic, this was after all total war. The Japanese transport ship Borneo Maru was sunk on 5 October 1942 during early days of the campaign. 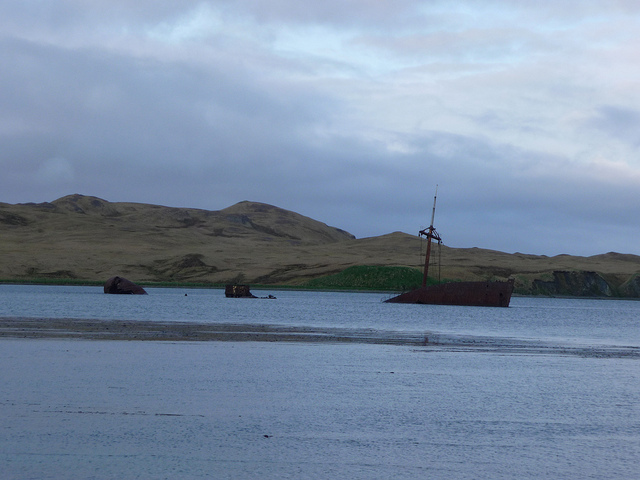 Its remains are still in the harbour. While the island was being bombarded, US Navy warships ensured that the Japanese supply line to the two islands was essentially strangled. This would ensure that the Japanese occupiers would be at their lowest ebb when the islands were retaken. A date was set – August 15 1943. A considerable fleet set out to retake Kiska. Yet, the Japanese had made their escape several weeks earlier. 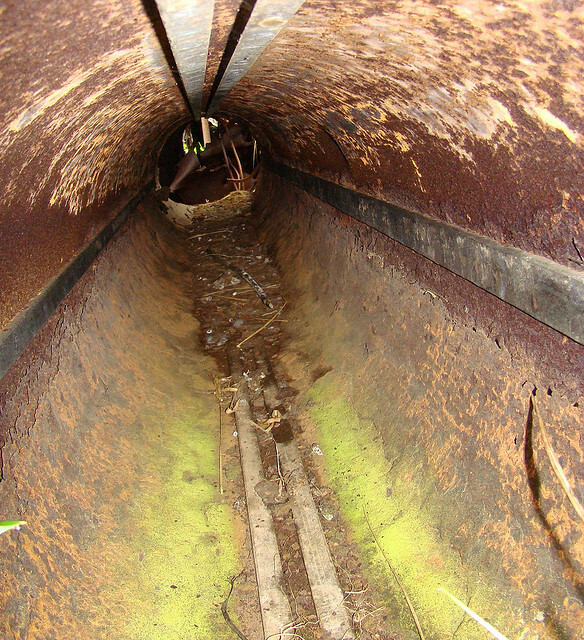 In late July they had wired Kiska City with charges and destroyed as many of their supplies and ammunition as possible. Then, on the evening of the 29th they set up a radar diversion. 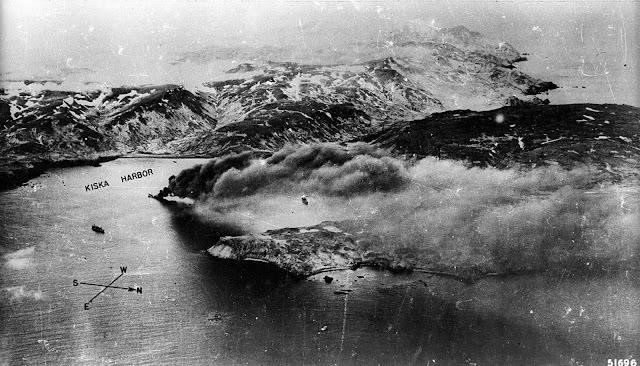 The American warships which were around the islands fell for the ruse and left room for an evacuation fleet of eight warships to quietly steam in to Kiska Harbor. 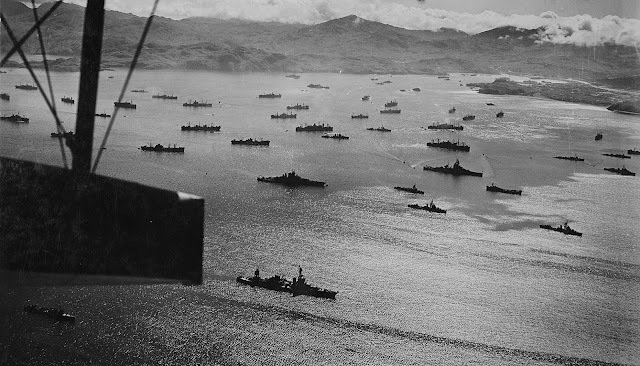 In less than an hour over 5,000 Japanese soldiers disappeared like ghosts in to the Aleutian mist leaving behind a base and harbor rigged to wreak havoc on whoever entered. 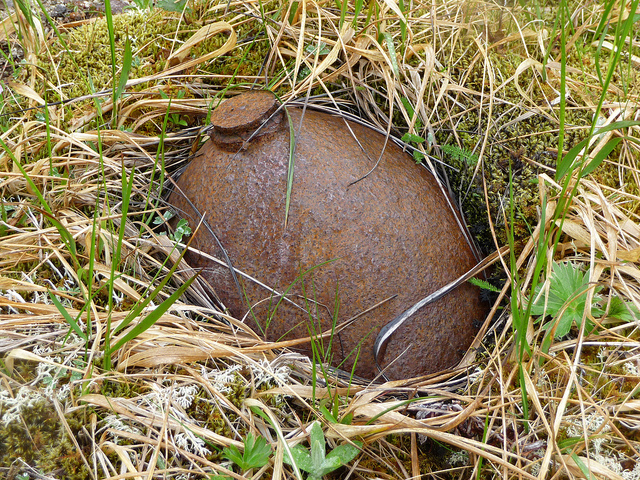 Even today the island is littered with the ordnance they left behind, much of it unexploded. 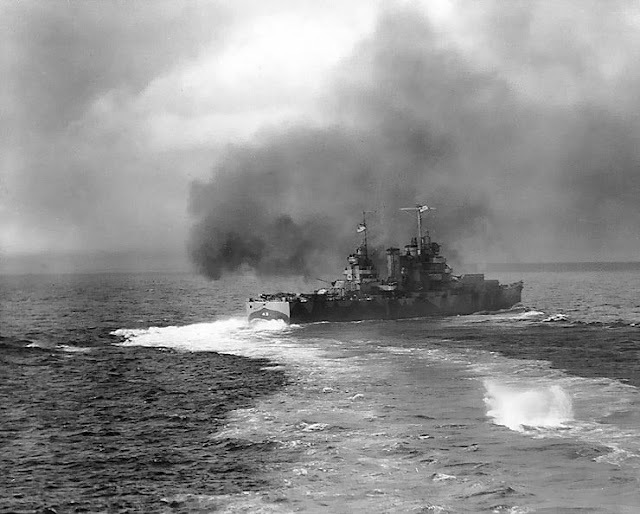 There was a final bombardment by warships, including the USS Nashville, above. 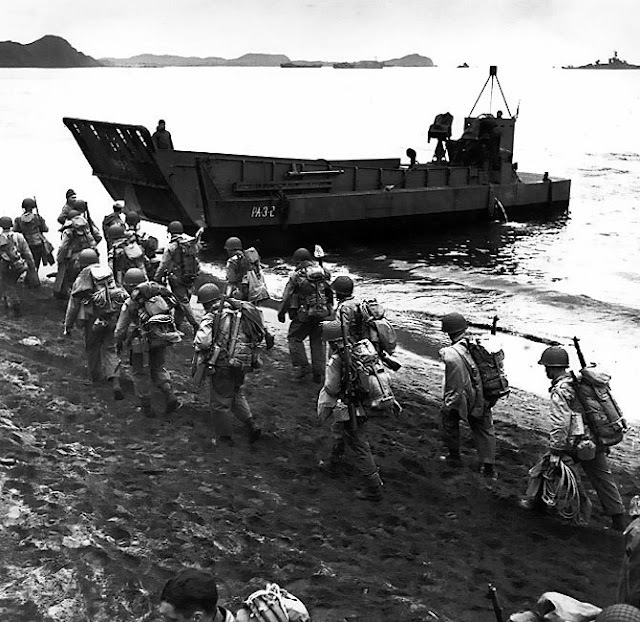 Then, on August 15, 35,000 American and Canadian troops landed on the islands. 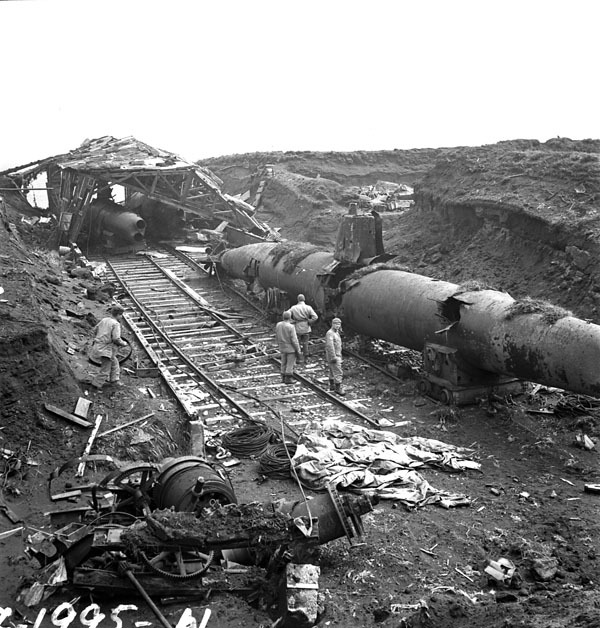 They were prepared for heavy casualties – the size of their force reflected the intelligence which had been gathered, indicating a Japanese presence of over 20,000 on the island. Instead of Japanese infantry the liberation forces were greeted by a handful of dogs, one of which was Explosion, originally owned by the small US Navy Weather Detachment and subsequently adopted by the invaders after the American team had been taken to Japan. 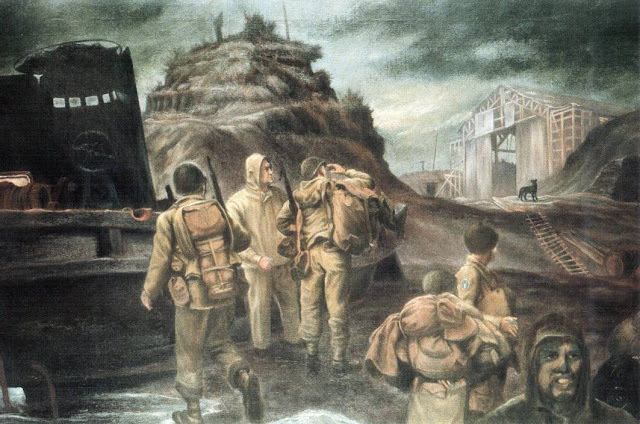 The discovery of the deserted Japanese base (and Explosion's return to his compatriots) was subsequently painted by the war artist Edward Laning. Yet that was not the end. Incredulous at such a speedy and total evacuation, troops began a systematic search of the seven square mile island. 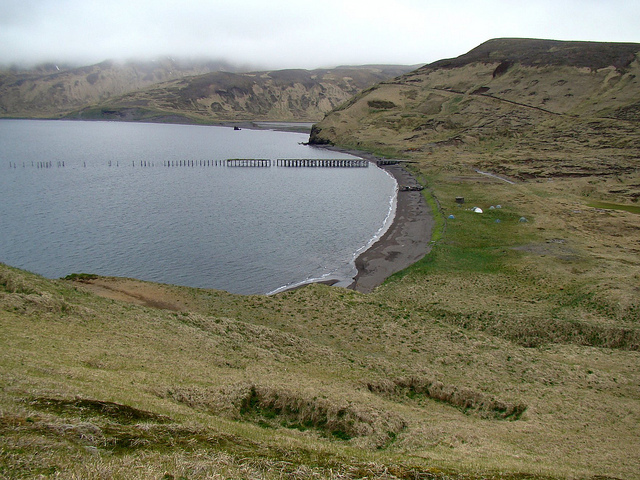 The island took over a week to comb, during which time over thirty soldiers were killed by booby traps or friendly fire. The Japanese had retreated hurriedly. 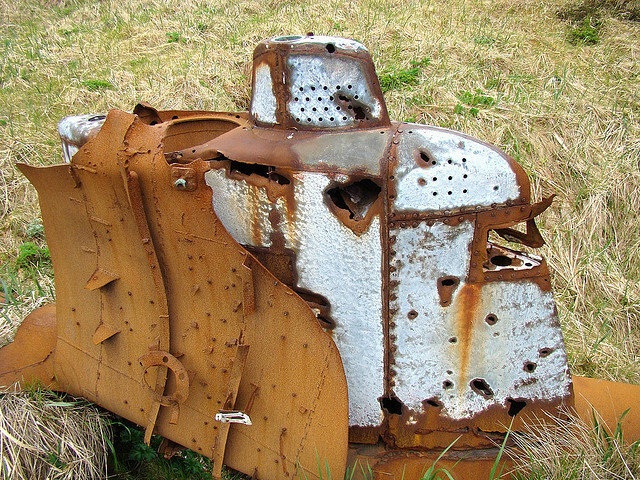 Among the detritus were a number of small submarines, gaping holes blown out of their sides. Then the ship Abner Read hit a mine in the harbor and a further 71 perished. The ship was repaired at Puget Sound, Washington (see picture above). 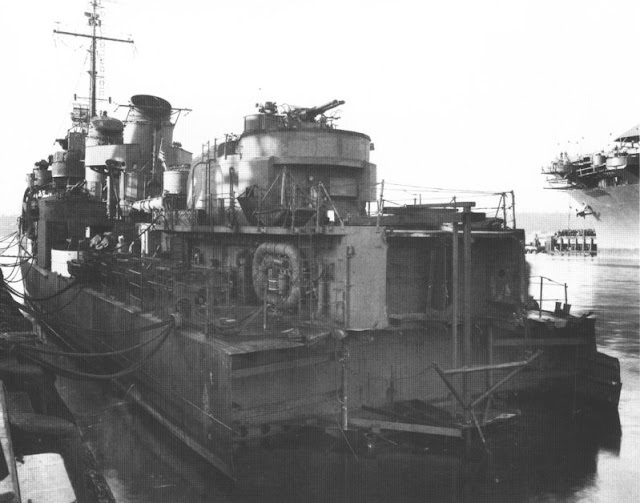 It returned to active duty only to be lost to Japanese Kamikaze Aircraft off Samar on November 1 1944. 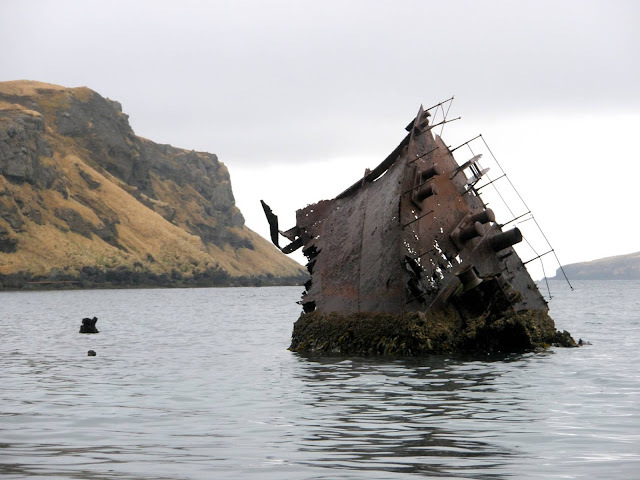 Nevertheless after 439 days the Aleutian Campaign came to an official end. 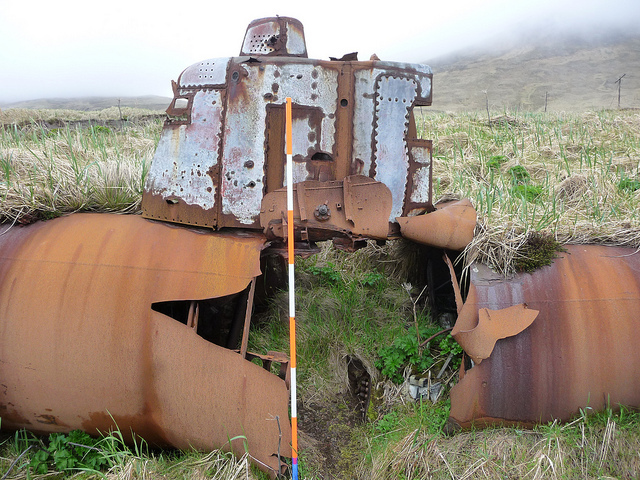 Much of the ordnance was left behind. 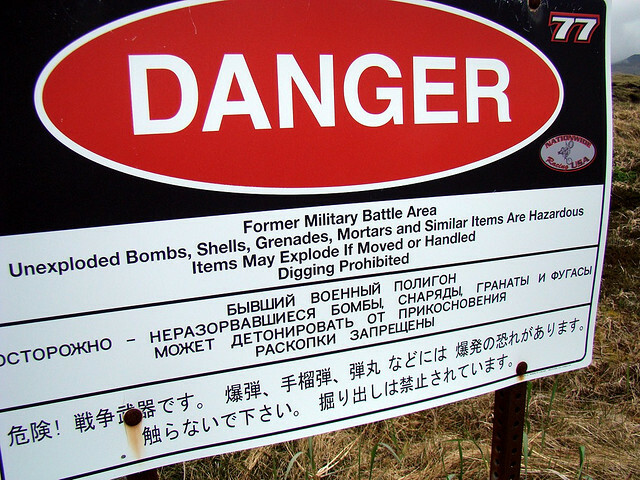 A sign warns today's visitors in English, Russian and Japanese of the dangers still lurking on the island. 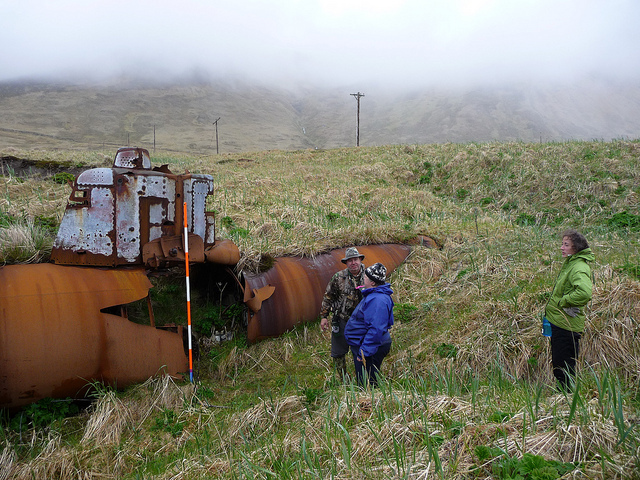 The site where the Japanese occupied Kiska now holds the maximum level of recognition given to historic locations in the US. It is a National Historic Landmark, only one of 2,430 in such an immense country. 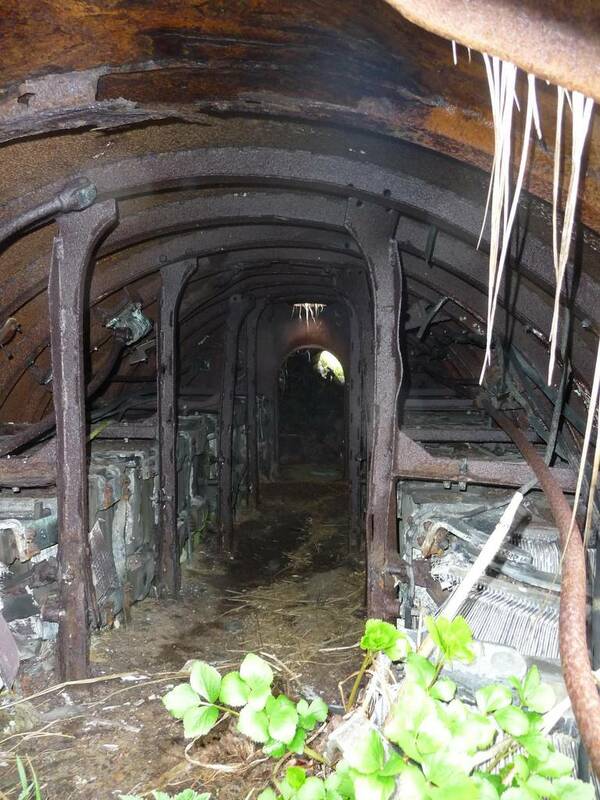 Considerable amounts of relics scatter the hills surrounding the harbor, equipment dumps, gun emplacements, tunnels and those small experimental submarines. There they will stay as a memorial to those who fought and who lost their lives in the reclamation and liberation of American soil from forces of invasion.